How To Buy The Best Cot Bed - Which? 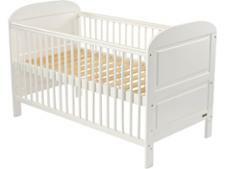 The best cot beds are safe, easy to assemble, durable and easy to convert from cot to a bed. Find out how to avoid a flat-pack nightmare. A cot bed needs to look good in your little one's nursery, but you also want one that's going to keep your baby safe while sleeping and be easy for you to use and put together. As well as thinking about whether you want a white cot bed, a grey cot bed or a pink or blue design, you also need to think about whether you want to go for a sleigh cot bed or a standard style straight-sided type, whether you want one with drop sides and if storage is important you'll be after a cot bed with a drawer. Our expert guide arms you with all the info you need to get the best cot bed for you, your baby and your budget. See the models Which? recommends in our cot bed reviews. How much do I need to spend on a cot bed? With prices anywhere from £70 for a basic model, up to £600 for a luxury cot bed, it's worth shopping around to choose a suitable sleeping solution to last you through your baby's early years. Generally, the more you pay, the more solid-looking a cot bed you get, but you don’t need to pay through the nose to get a cot bed that is safe and durable. Join Which? now to browse our cot bed Best Buys. Already a member? Log in now to see our reviews and star ratings. Cot beds with drop sides usually cost around the same price as fixed-side cot beds, depending on the brand, so if you want a drop side you don’t always have to pay more. Cot beds with under-bed storage and day-bed or sleigh-bed styles will generally cost more. When you're budgeting for a cot or a cot bed, don't forget that you normally have to buy the cot mattress separately. A cot bed is a cot with removable sides, so it can be converted into a toddler-sized bed when your baby gets bigger. Cot beds are increasingly popular because they aren't that much more expensive that a cot, but they're bigger and you'll get more use out of it. Plus, it helps make the move from a cot to a bed a bit easier for your little one. You'll need to buy a mattress that is the correct size for a cot bed, rather than one designed for a cot. Retailers normally tell you which mattresses are suitable for the beds they sell, or read our guide to . Some cots have one side rail that can be dropped down to give better access for getting your baby in and out. The drop side and the back rail are usually removed to turn it into a junior bed. Drop sides are particularly useful if you are short, or have a large tummy, which can benefit from resting gently on the top of a drop side as you put your baby down. 'Nudge and lift' mechanisms, where you push the side of the cot into a position where it can be lowered, can be useful – that's because you can operate them with one hand. Other cots have a trigger mechanism, a foot pedal or a couple of catches to undo to release the drop side. When we surveyed more than 600 parents who had bought a cot bed, they told us safety was their number one consideration when shopping for it. Sleigh cot beds are popular with parents – they have an appealing look of grandeur and solidity. They're named sleigh cot beds because of their wavy design which makes them stand out from standard cot beds with their all-straight sides. Sleigh cot beds can be drop-side or fixed-rail cots, and the side rails are removed to turn them into a bed. Check that the shaped ends, which are usually bolted either side of the head and foot boards, do not create a dip or groove between the pieces of wood where your baby's clothing could get caught. Some cot beds utilise what's effectively dead space beneath the base and between the legs to include a drawer. A cot bed with a drawer might be ideal for you if your baby's nursery is small and lacks storage space. You can find standard style cot beds with storage and you can also get sleigh cot beds with drawers. If you've already decided on a cot bed, you can see details of different options available and our Best Buys by checking out our cot bed reviews. 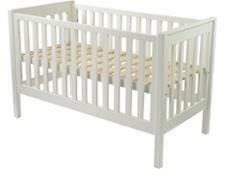 Cot prices start at around £70 for a basic cot, up to around £700 for a luxury solid oak model. Cots are generally smaller than cot beds – around 50-60cm wide – so if your baby’s bed will be in your room until he or she is six months old, as is the current advice, a cot may fit more easily if space is limited. Sizes do vary, though. Cots designed to fit 'standard-sized' cot mattresses are a few centimetres narrower than cots designed for 'continental-sized' mattresses, although they're often a similar length (around 140cm). Measurements should be clearly displayed on the cot label. If you need help choosing a cot, head to our guide to choosing a cot, where you’ll find expert advice and shopping tips for buying the best cot, including what to consider when buying second-hand. A cot bed is a cot with removable sides and a removable end panel that can be converted into a toddler-sized bed. Cot beds are larger than cots – generally around 70cm wide – so they give your baby a bit more space to roll about and stretch their arms, but they’re not necessarily much more expensive. If you have the space, it might make sense to buy a cot bed from the outset, as it will last longer and you can avoid the hassle of having to buy two separate pieces of furniture. Why buy a cot bed rather than a cot? An old-fashioned crib or cot is soon outgrown. The big advantage is that a cot bed will last you longer than a cot because it is used both as a cot and as a junior bed. Our furniture experts told us that most cot beds will last until a child is nine years old. But this will depend on the weight of your child, and how much wear and tear they put the bed through. As your child grows, do regular checks to make sure that all of the bolts of the bed are firmly screwed in place and that the joints are solid. Examine the slats for signs of cracking and damage. But if you’re planning on more than one child with a small age gap between them, a cot may be more suitable, as you’ll more than likely use the cot for the new baby and buy a single bed for your older child. Cot beds are generally bigger than a cot, and although there is a lot more variation in sizes, most cot beds are quite similar, which is about 146cm long and 77cm deep, and somewhere between 90cm and 105cm tall at the head end. Most cot beds have side rails that are around 84-87cm high in the highest position, which makes them challenging for shorter people to reach over to lay a sleeping baby down. A cot bed with a drop side will reduce this height, making it easier to reach your baby when the base is on the lowest position. Double check the cot bed you choose will fit in your bedroom (where your baby is meant to sleep for the first six months), as well as where you plan on having it the nursery. Consider things like the solid ends of the cot bed. These look nice but make it harder to check on a sleeping baby as you'll only be able to see your baby through the side rails. 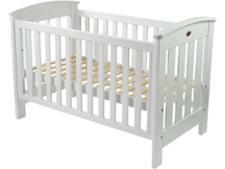 Most cot beds have a base that can be adjusted as your baby grows, usually with three positions. When your baby is small, the mattress sits on the highest base level for the first few months, so you can lift your baby in and out easily. The instructions usually recommend that the lowest position is the safest and should always be used as soon as your baby starts to move about a bit and pulls themselves up, which can be about eight months old. You may think it is pointless going for a three-position cot bed in this case, but it's normal to use the second height position for the bed mode, as the lowest one can be a bit low for a bed. With a choice of several heights, you can adjust the bed to suit your child, however old they are. A teething rail protects your cot bed and your toddler from damage caused by each other. Chomping on the edge of a cot is a habit many teething babies relish. Choosing a cot with a teething rail – a protective covering on the side-edges of the cot – helps to avoid cot bed damage. Storage drawers under the cot bed can be a useful addition to help save space and keep clutter out of sight, but don't forget to check that you'll have enough space to pull the drawer out from under the bed, through a mountain of building blocks or soft toys. Don't forget, whatever bed you go for, it's crucial to get the right type and size of cot mattress to go in your chosen cot or cot bed. 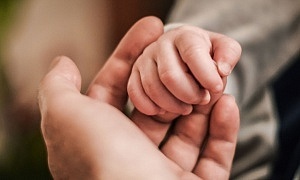 The Lullaby Trust, which promotes advice on safer sleep for babies, recommends that you buy a new cot mattress or, if using a used mattress, carefully check that it is clean, dry and free from cracks or tears beforehand. Your cot mattress should be firm, with no sagging, and should fit the cot snugly with no gaps. Read more safe sleeping tips in our dedicated guide. Mattresses are normally sold separately from a cot bed, giving you a choice of different types, but the manufacturer will make recommendations for the size of mattress you should use. Cot mattresses – read our guide to cot mattresses for more essential safety information. When it comes to the safety of your baby, you can never be too careful. Especially when creating a safe sleeping space. 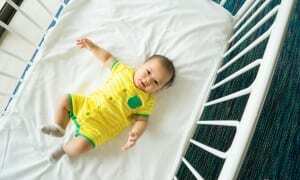 Buying a second-hand cot could save you some cash, but there are some essential safety tips to read if you are thinking of doing this, or you're getting one from friends, or are even tempted to use an old family heirloom. Get a copy of the original instructions. Many can be downloaded from the internet. Buy a new mattress for the cot. Check whether the cot conforms to British (BS EN 716-1:2008+A1:2013) or European safety standards – look in the instructions for a BS number or check for markings on the cot itself. Make sure it's in a good condition and nothing is broken or worn out. Measure the bar spacing: the bars should be no more than 6.5cm apart, so your baby can't get stuck between them. Check that there is at least 50cm between the top of the mattress and top of the cot. Check there are no protrusions on the top rails where your child could catch his or her clothing, or get anything caught around his or her neck. Check that the drop-side mechanism works smoothly and stays reliably in the ‘up’ position. Check that the drop-side is secure and can't be lowered by a child. Check there are no footholds or cut-outs or ledges in the sides or the ends that could help a baby climb out. Make sure that the mattress is the right size - there should not, at any point, be a gap of more than 3cm between the mattress edge and the cot. Remove any transfers on the inside of the cot because they could come off and become a choking hazard. Accept a cot unless it comes with the original instructions, or you can obtain a copy of the instructions from the manufacturer; they contain important advice for using the cot safely. Use an old family heirloom, as it probably won’t meet current safety standards. Use a worn, dirty or damp mattress. Choose a mattress with handles - they may trap your baby's hands or feet. Stick decorative transfers and labels on the inside of the cot or anywhere else your baby can reach. Whether you're buying new or second-hand, our cot bed reviews are a good place to start to make sure you get a safe and durable cot bed for your baby.